PCalc 1.5 for the iPhone arrived in the App Store a week or so ago, which has had two effects on me. First, it’s made me feel guilty about never finishing my Definitive Series on its configuration and use (which petered out after parts 1, 2, 3, and 4). Second, it’s made me happy to see two new sets of functions: one that I’ve been hoping for since I started using PCalc; and the other that caught me by surprise but which I expect to use regularly. No, the colored boxes are not part of the layout; I overlaid them to draw your attention to the keys with the new functions. The turquoise boxes surround the hyperbolic functions and their inverses, which are the functions I’d been waiting for. 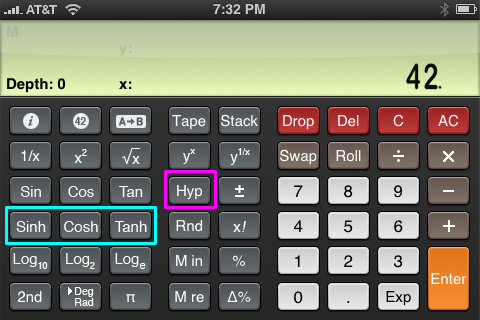 Apple’s iPhone calculator has these functions, as does every scientific calculator I’ve owned going back to the TI SR-52 I got as a high school graduation present. To me, their addition makes PCalc complete. If you’re not familiar with hyperbolic functions, take a look at the Wikipedia and MathWorld articles about them. They arise most commonly in the solution of linear differential equations and appear in engineering formulas that express those solutions. These are delightful functions, because they take very common calculations and reduce them to the minimum number of keystrokes. No more square root of the sum (or difference) of squares. I’ve never owned, or even seen, a calculator with these functions, but they felt right as soon as I started using them. PCalc’s functionality seems nearly complete. It’s not programmable, but programmable calculators seem vaguely anachronistic nowadays; also, Apple may not allow programmable apps for the iPhone. The only deficiency that comes to mind is its single memory location—seems a little chintzy on a 16 GB device.